Home > Reviews > Small Scale > Dragon Armor Pro Kit No. 7339 - Sd.Kfz. 171 Panther Ausf G w/ Steel Road Wheels. Stock Number and Description Dragon Armor Pro Kit No. 7339 - Sd.Kfz. 171 Panther Ausf G w/ Steel Road Wheels. 122 pale grey plastic parts on three sprues plus two individual parts, 2 lengths of DS100 tracks and markings for 5 vehicles plus a two page instruction sheet with a parts plan, 11 photo type build diagrams and 1 page of three view paint/decal instructions. Advantages: The most accurate Panther in the scale, excellent track sand decals. Disadvantages: Very poor instructions and no PE. A quite rare version of the Panther, once you get past the horrible instructions it is not a bad kit but an out-side reference would be an advantage. Designed and built as a response to the Soviet T-34, the German Panther was considered one of the best designs to come out of the war. The Ausf G was the third and last produced and for a short period, Sep 44 – Mar/Apr 45, they were built with steel road wheels instead of the rubber tyred ones to save on rubber. 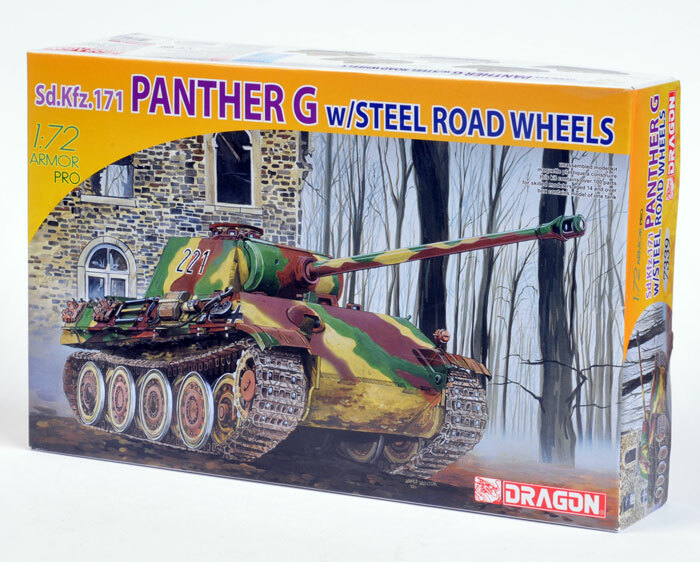 This is about the fourth or fifth Panther that Dragon have given us and the first was way back when Dragon first got into 1:72 scale armour kits, which means it wasn’t very good but was still the most accurate around and still is today. 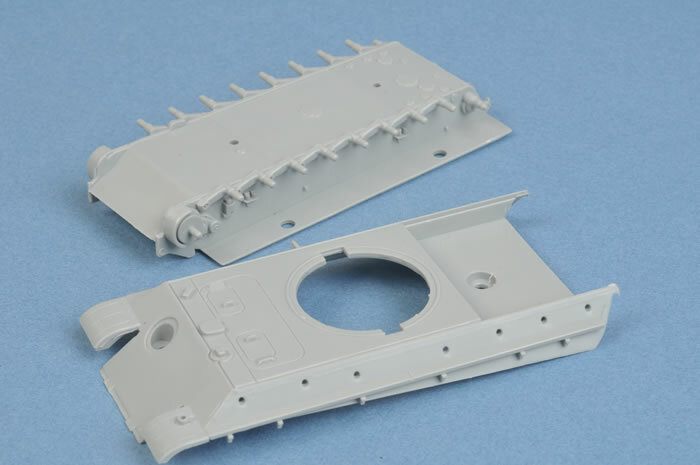 They’ve improved a bit since then, getting rid of the white metal hull, adding DS100 tracks and producing a version with Zimmerit but some of the multi-part sprues are still a little rough with misaligned mould halves and a bit of flash. They have also only done the Ausf. G series with no sign of the D or A models. One thing that hasn’t changed is the atrocious instructions. 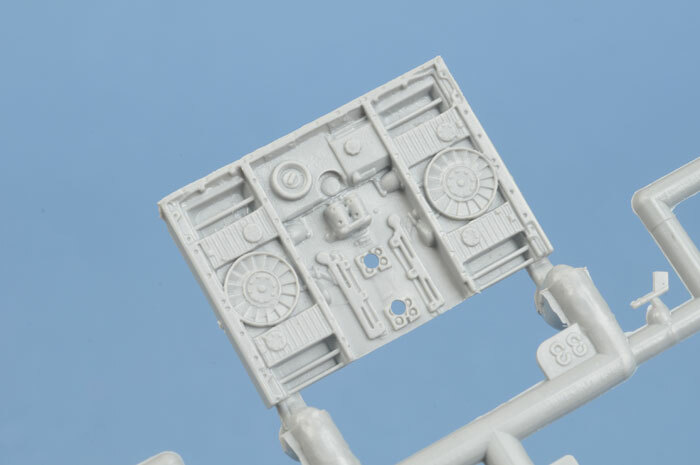 They are of the photo type introduced with their first small scale kits and after some complaints from customers, changed back to the line drawing type. 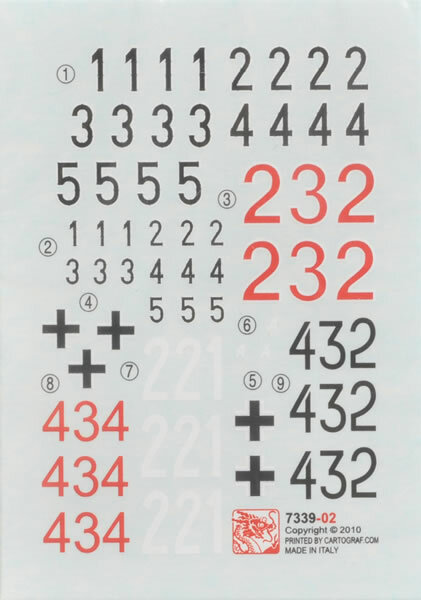 However, because this kit is just a modification of one of the early kits we get the original instructions with just the appropriate changes and additions. This makes it hard to see how and where some parts fit and others are just left off altogether. 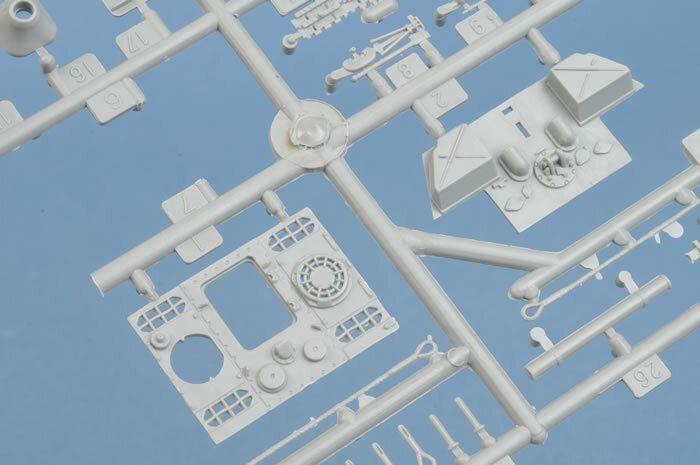 The steel wheel sprue looks like it may have come straight out of a late Tiger I or perhaps a Tiger II kit, but they are not the nice linked wheels seen in the mid or early Tiger kits. The most recent Panther G kits had a photo-etched fret for the engine intake screens etc. but, like the original, this one doesn’t. Okay, I’ve been fairly critical but this is still a good kit. 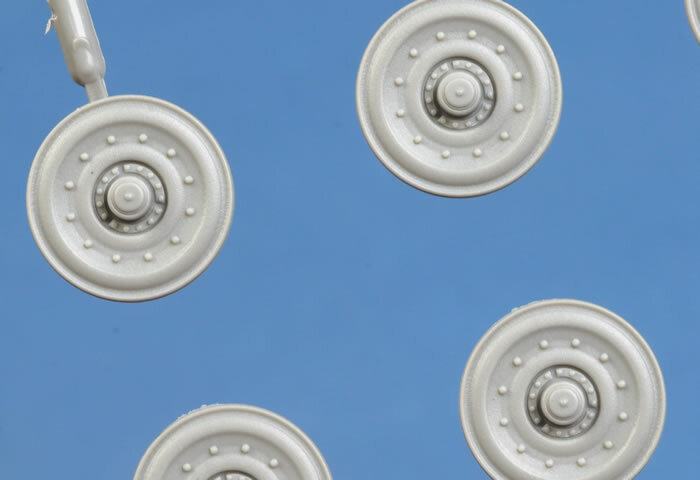 If another manufacturer gave this to us we would be raving about it and how someone else is giving Dragon a run for their money, but we know Dragon can do so much better.